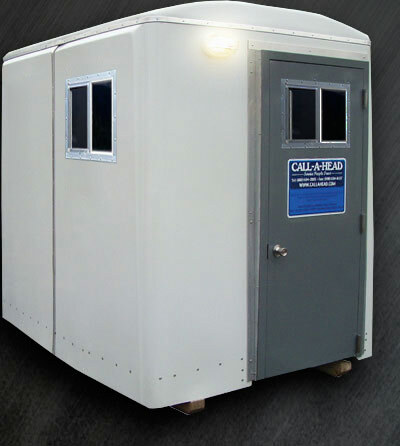 The Call-A-Head Corporation, New York’s premium portable toilet company has upgraded yet another of our quality products with the creation of The Guard Shed 48. Guard Shed 48 is the largest version of our guard sheds offering 48 spacious square feet and comfort to suit your growing guard shed needs. The Guard Shed 48 was designed with complete custom detail and boasts plenty of room for two guards, a table and chairs which include ceramic light fixtures and a front door patio light giving you the superiority only Call-A-Head can give. The Call-A-Head Corporation designed and manufactured The Guard Shed 48 using only the highest quality products with strong fiberglass construction, gel coat painted finish and commercial steal door complete with beautiful blue signage showing its “Mark of Excellence” of being a Call-A-Head. 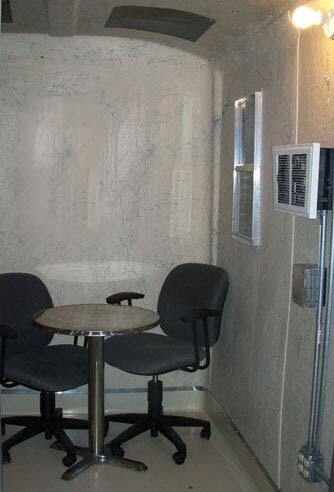 Complete with heat and electric this unit will supply the utmost comfort for your tour of duty. Since we at Call-A-Head also care about our customers, we offer a Police lock option on the Guard Shed 48 for your safety. With over 500 units out on location and growing daily, it's no wonder the Call-A-Head guard sheds are by far the most popular guard sheds available in the New York area. When quality, comfort and service you can trust is what you desire, accept no imitations, Call-A-Head for your Guard Shed 48 today for immediate delivery! Door opening - 29.5” x 71.25"
Window Size - 20" x 16"